A macaron is a French sweet meringue-based confection made with egg white, icing sugar, granulated sugar, almond powder or ground almond, and food colouring where applicable. The macaron is commonly filled with ganache, buttercream or jam filling sandwiched between two cookies. 2. Strain the cooked cream through the sieve and leave it to cool. 3. Beat the butter on high speed till it becomes lighten in colour. 4. 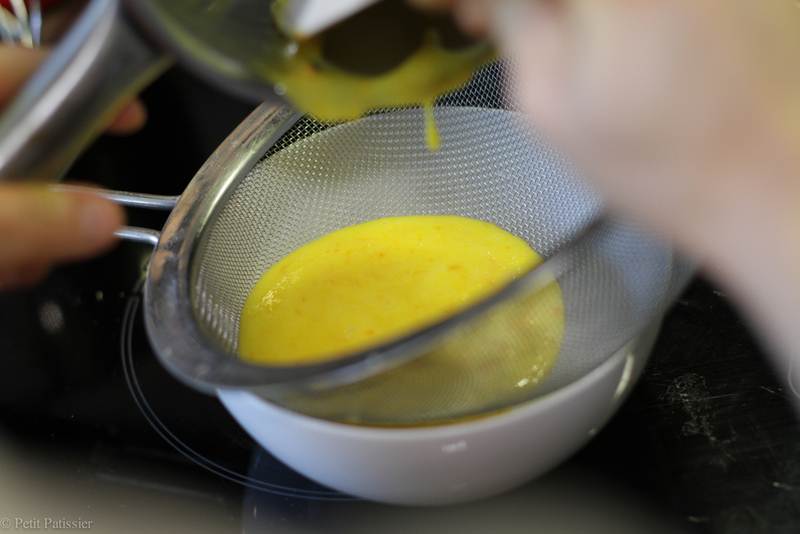 Add cooled mandarin cream to the butter and beat till all incorporates into a smooth mixture. 5. Put cream into the piping bag. 1. 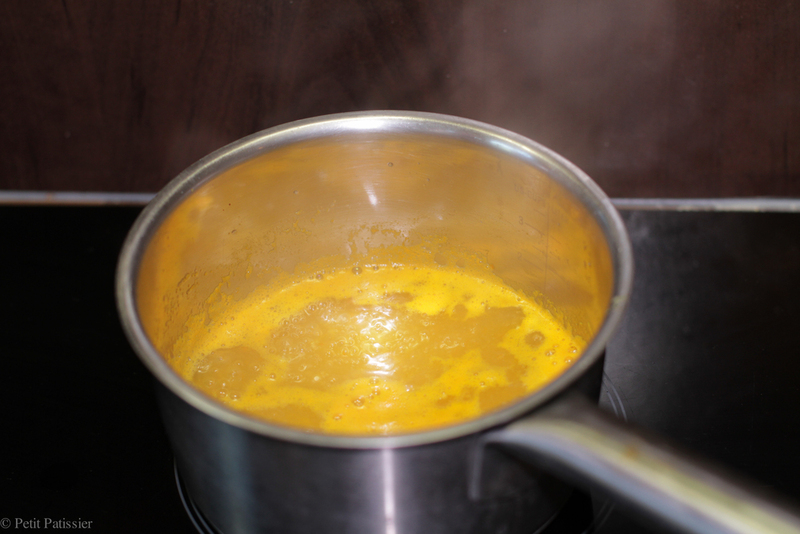 200 g of mandarin juice bring to boil, continue boiling until juice will be evaporated to 100 g of concentrate. 2. 100g of concentrate mandarin juice, zest and sugar bring to boil. Add agar-agar powder and whisk. Cook for about 2-3 minutes on low heat and continue whisking. 3. Pour mixture on the tray and put it into the fridge till set. 4. 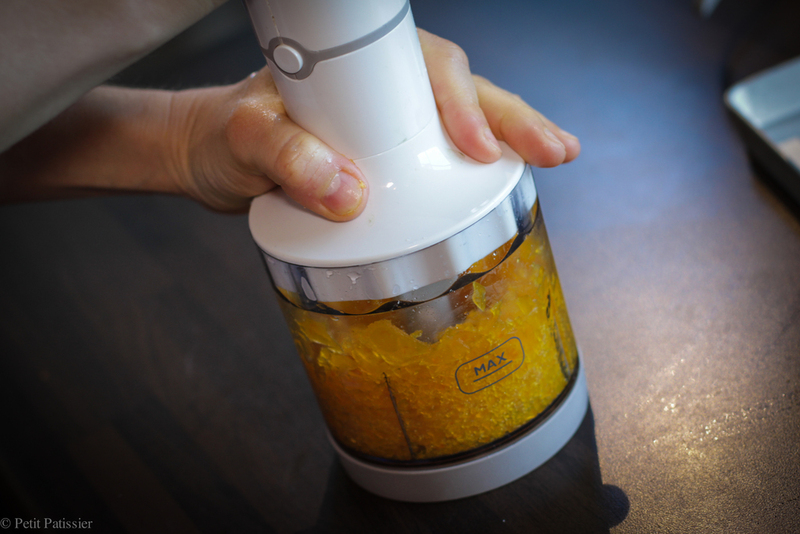 When mixture is set, remove it from the tray and puree in the blender till smooth consistence. 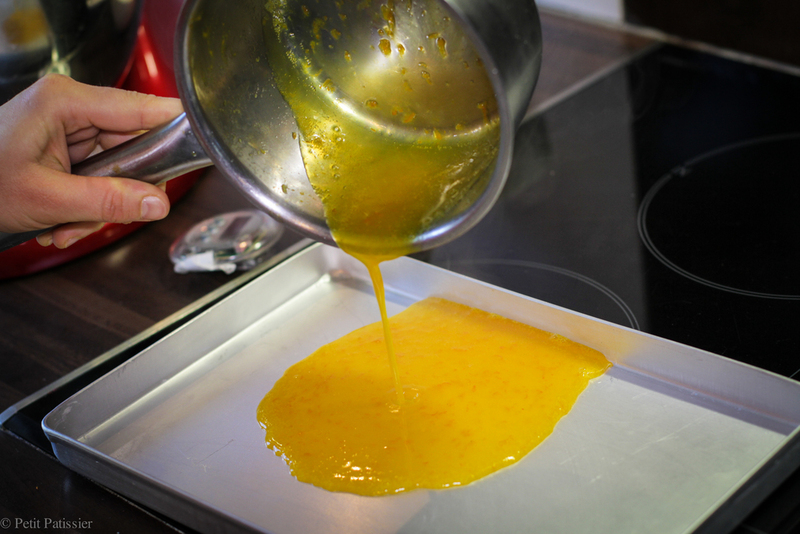 (If mixture is to thick and hard to puree, add a little bit of mandarin juice.). 5. Strain gel through the sieve and put into the piping bag. 1. For meringue: make the sugar syrup by boiling water and sugar in the saucepan, when temperature reaches around 110C start to whisk the egg whites on high speed until soft peaks. 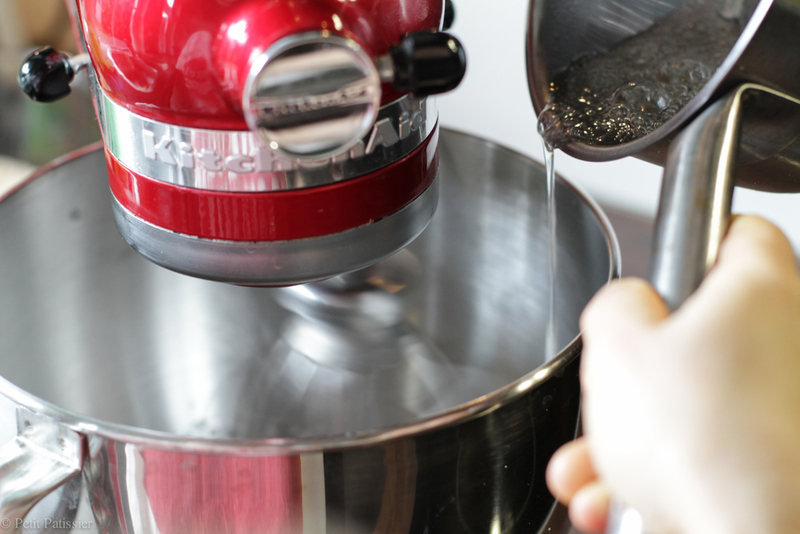 When the sugar syrup reaches 119C, reduce mixer speed to low and pour the syrup on to the beaten egg whites in a thin, steady stream, change mixer speed to medium-high and continue whisking till meringue cools down to 45C-50C. 2. 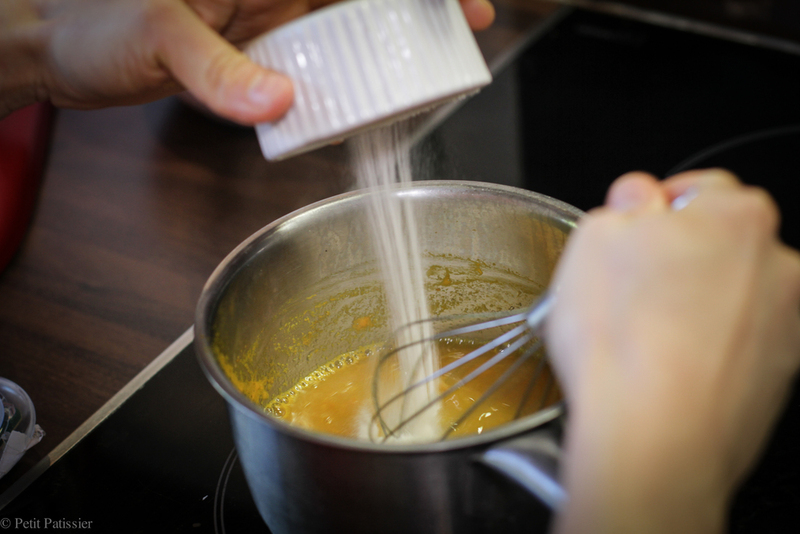 For almond paste: sift together ground almond and powdered sugar, add food colouring powder, mandarin zest and mix. 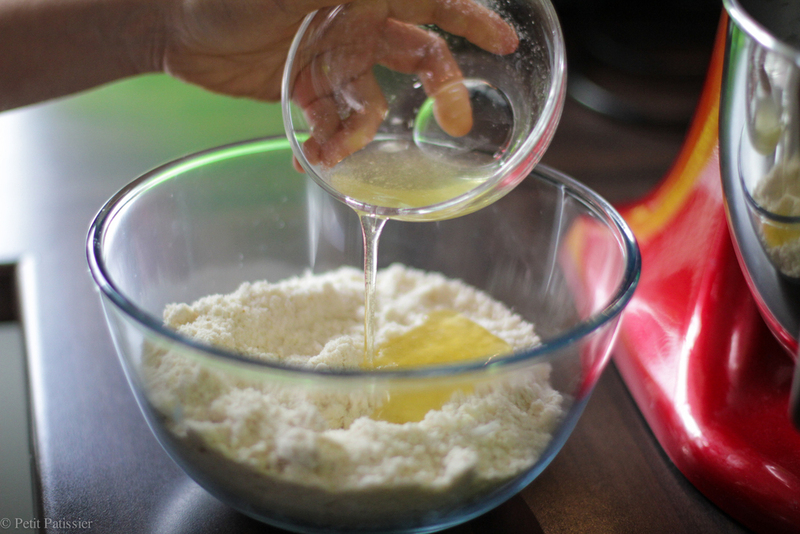 Add egg whites to dry ingredients and mix. 3. 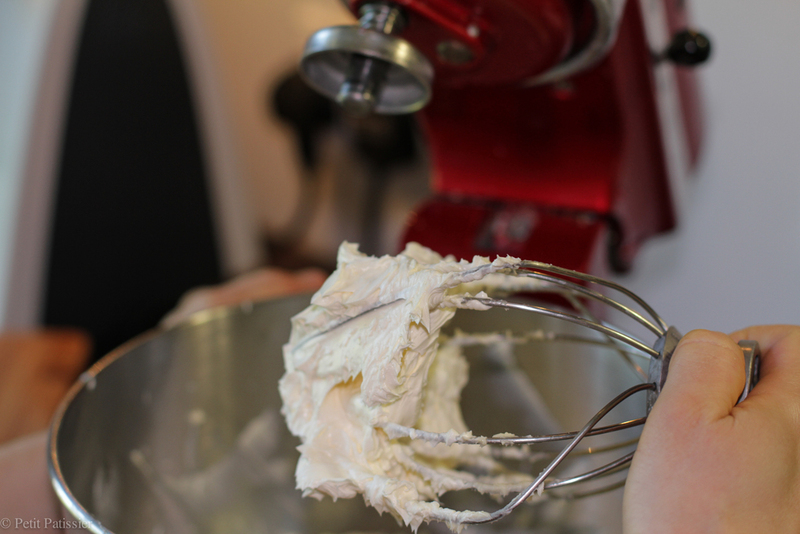 Fold the meringue into the almond paste until well combined. 4. Pour the batter into the piping bag with a plain 1 cm Ø nozzle and pipe about 120 discs 4 cm in diameter on silicone mat. 5. Set at room temperature for around 30 minutes to allow a skin to form. Touch by a finger the top of the disc, if not sticky, they are ready for baking. 6. Preheat the oven to 150C, bake for about 15-20 minutes. Test by touching the macaron with your finger and pushing gently from side to side, if it still soft, continue baking, if it just slightly moves from side to side then is done. 7. Slide silicone mat from the baking tray to a wire rack and leave the shells to cool. 8. When shells cooled completely, remove them from the mat and sandwich macarons with mandarin cream and mandarin gel. Keep in the fridge in airtight container for 3 days or freeze for up to 1 month. Take out of the fridge 1 hr prior serving ensuring macarons reaching rooms temperature.